Hearing that tinkling ice cream truck bell still—still!—makes our heart race a little. Bleating unrecognizable tunes like a slow-dying jack in the box, the truck rolls through some random composite scene of your remembered childhood. The trucks all look the same, all scuffed white paneling plastered with peeling colorful stickers of some semblance of a menu. To your overwhelmed kid brain, there are thousands of choices—flat cartoon faces on sticks with gumball eyes, a taco made of chocolate. It seems impossible that all of them could be stashed on this one janky but miraculous truck, impossible that anyone could decide between them with any degree of certainty. And we ran for this truck, just like the saying goes, which begs the question: why was it always driving away? How many times was standard to circle one neighborhood? No matter where you were, or how prepared you were, it was always something you had to desperately flag down as it cruised down the block. There was no discernable schedule: when it came, you had to be ready. So much stress contained in those tiny fists clutching crumpled bills! Maybe it's because we're grown-up, but it feels like ice cream trucks are rarer creatures than they used to be. Now, sometimes when you catch them out of the corner of your eye—that familiar flash of stickers on white paneling—they're steadily cruising empty neighborhoods, like they're lost. We don't run for them anymore. But maybe we should! There are few occasions in which we get to bust out that awkward half-walk, half-trot, after all: public transit, ice cream, and for the misguided among us, crosswalks. THIS ARTICLE IS PART OF OUR MISSION TO ENJOY THE LAST 50 DAYS OF SUMMER LIKE IT'S NOBODY'S BUSINESS. SEE THEM ALL, HERE! The old-timey sweet you literally never remember until you hear the ocean. The Big Gay Ice Cream Interview! Betwixt The Sugar Fairy herself, Rebecca Masson, & BGIC's Douglas Quint. Can't get to a Baskin Robbins because it's not 1996? Make your own. Of course the best ice cream on the planet is made by such a sunny individual. Duh. 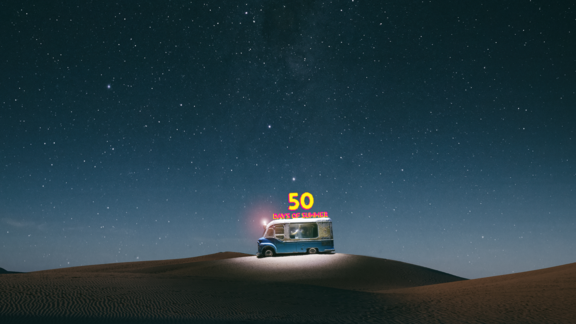 There are 50 days left of summer (GAH) — get your kicks in while you can.